I absolutely love stickers but they are an overlooked marketing tool. Cost effective to print, they can be used in any number of ways to promote your brand, quickly and easily. They come in a range of shapes and sizes and used well, can really enhance your brand. Print a generic design and it will work on a large range of marketing for a number of years, or print a small run for a specific campaign or event. You can provide clients with extra information about your business, prices, information on products and services, direct them towards your social media, or even tempt them with special offers. Just think creatively how you can use them to market your small business and raise your brand awareness. I very rarely send anything out now but on the rare occasion that I do, I always pop a sticker onto the envelope. It gives a nice finishing touch and the recipient knows exactly who it’s from. I’ve also used it on CD boxes and on proofs for clients. Rather than printing hundreds of compliments slips that you’ll rarely use, buy some thick, luxury notepaper and put a sticker on the top. Car manufacturers have been doing this for years, putting a sticker in the back window of every sold car. How could this work for your business? A sticker with your logo and contact details on the back of a laptop or electronic goods, water bottles, or even unbranded products using a clear sticker with your logo. Push your brand image and use on giveaways to potential customers – think notebooks and small gifts. Ideally something your customers will hopefully find useful and use regularly like a memory stick or notebook. I use small A7 notebooks which fit easily into a handbag or pocket. A bulk buy of yellow notepads plus some stickers and personalisation, you have a lovely, personal giveaway at a networking event or client meeting. Stickers can give your packaging a lovely personalised feel and also be a cost effective way to create labels. You can even add a few in with your orders which hopefully customers will use and raise your brand awareness, and it might just brighten their day especially if it’s something fun or beautiful. You can buy plain packaging and use them to highlight your services or products as it draws the eye. If you use a lot of packaging in your business, take a peek at my blog Pretty Packaging – 10 easy ways to brand your packaging for some ideas and inspiration. Do you have a sale or special offer on? You can print a code on the sticker for customers to redeem later, tempting customers towards your website or your shop. Stickers are extra useful during events and exhibitions – you can stick them on the back of your business cards and then monitor the response of your offer and see how effective it’s been. Stand out from the crowd and use a sticker to deliver your message. Stick them on bags, giveaways or even on visitors jackets! You can use the stickers instead of a business card or alongside your business card. Adding them to info packs and goodie bags might tempt people to use them on their computers, laptops or notice boards. You can easily change the message depending who you are targeting and have different stickers for different events. Use a sticker on your flyer or throughout a brochure in strategic places to add interest and draw attention. You could even add a sticker to a certificate to make it feel extra special. Print a generic certificate and different grades of sticker depending on different levels passed. It’s a nice touch especially if you run courses and workshops. How about a Thank You sticker on a small packet of sweets sent with an order or for a particular customer. Or maybe on a wine bottle if you’re feeling particularly generous! 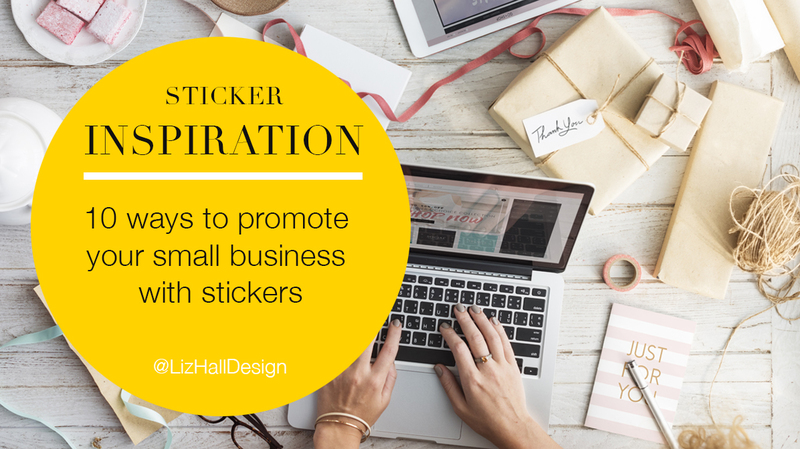 Create a series of stickers that direct customers towards your social media or your blog and website – make it fun and they’ll be tempted to have a look at what you have to offer. Print useful information on your stickers that will tempt customers to keep them for future reference or for you to stick to products. Alternatively, create some branded stickers that people will want to use in the office or at home such as organising – for jars, or for in and out trays. Stickers have so many different uses and can really help your small business stand out from the crowd and look unique. They can increase your business visibility and help build your brand by communicating your brand message to customers and potential customers. Stickers can help advertise your small business, support your promotional campaigns and strengthen your marketing in general. And they really are excellent value for money. Do you use stickers in your marketing? I’d love to hear how you use them in the comments.